Spending time with family and friends during the whirlwind of the holidays is important and prepping food to celebrate with a little Christmas cheer doesn’t have to take long. 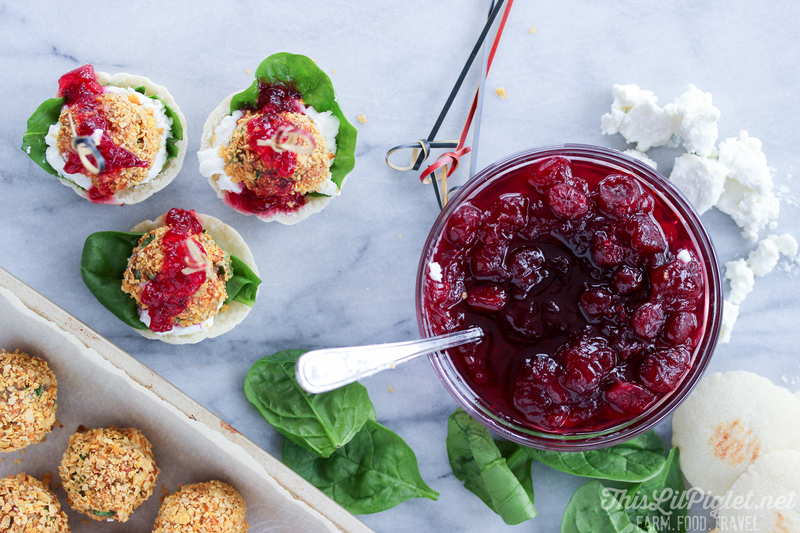 These Cranberry and Goat Cheese Stuffed Chicken Bites are easy to make and a delicious compliment to your favourite beverage. Disclosure: This is a sponsored post for Chicken Farmers of Canada. All images and recipe within are the property of Stacey Martin of This Lil Piglet and all opinions are 100% my own. 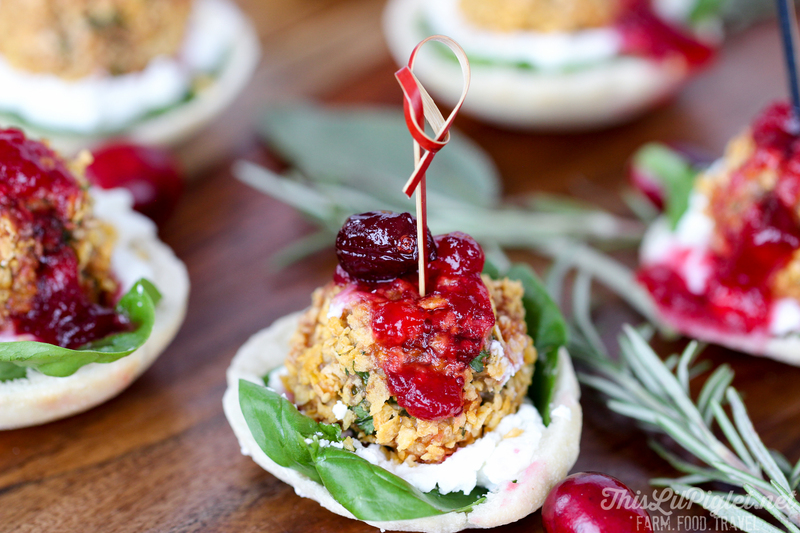 The chicken meatball reminds me of a miniature version of chicken dinner, filled with stuffing and paired with my favourite flavour combination, goat cheese and cranberries. Not only are they tasty but they look pretty fancy with only a few ingredients and minutes of preparation. With a crispy outside, a juicy chicken inside and a perfectly creamy tart but sweet flavour, you will have mouths watering for more. 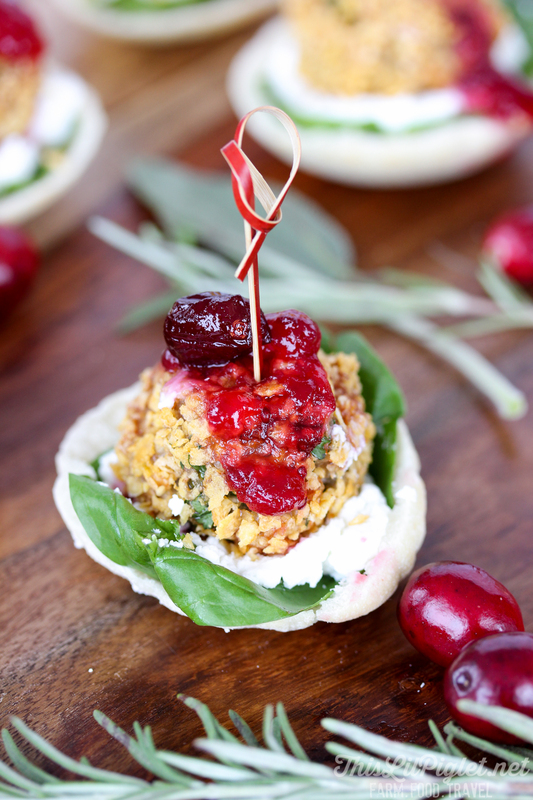 Make up a batch of these for your holiday guests through the New Year and your guests will clear the platter. That is if you can keep from eating your own appetizers first. While shopping for my ingredients, I choose the freshest ingredients. Specifically for chicken, I look for the Raised by a Canadian Farmer logo which tells me that the chicken is raised in Canada by farmers dedicated to producing unmatched quality chicken that meets the highest nutrient, food safety and animal care standards. Chicken Farmers of Canada is an association of over 2700 chicken farmers in Canada who are dedicated to raising the high quality chicken we all know and love. With its 3 pillars (import controls, production planning and producer pricing), the supply management system for chicken continues to evolve to meet the changing demands of the Canadian marketplace while keeping it open to a predictable level of imported chicken as well. These behind the scenes safety measure to ensure you purchase poultry for your family table. Check out my quick YouTube recipe video and if you like it, I’d love if you’d follow my YouTube channel for more great recipes and give me a thumbs up. For more delicious chicken recipes, check out Chicken Farmers of Canada recipes and follow on Twitter, Facebook, Pinterest and Instagram. Mix ground chicken with instant stuffing, egg, onion, parsley. Roll into 1 ½" balls then roll in the crushed corn flakes, placing onto a parchment lined baking pan. Cook in the oven for 25 mins. While the chicken is cooking, set aside other ingredients for assembly. 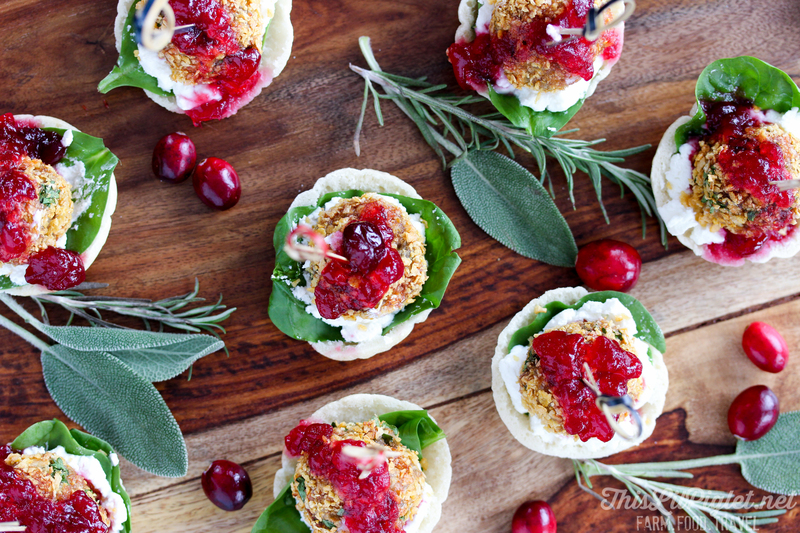 Assemble pita chicken bites with a pita bottom, spinach, chicken ball and a dollop of cranberry sauce. Insert appetizer skewer and set on a platter for serving. Serve warm.